The holiday season might be the most wonderful time of the year. But it’s also the time of year most laden with rich, tempting, high-calorie treats. While it’s fine to indulge in Christmas goodies here and there. If you eat too many, you’ll need a new wardrobe by New Year’s. 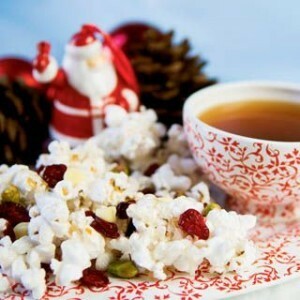 Here are some festive Christmas treats that are big on taste, but easy on the waistline. Whether you want to offer the kids a healthy alternative to sugar cookies or you need to take a simple dish to a holiday party, there’s bound to be something on this list to meet your needs. Best of all, these recipes are super easy and don’t take long to prepare — so they’re great if you find yourself needing to whip something up at the last minute! This snack is fun and tasty for the whole family. You can add red and green food coloring to this traditional holiday snack. Or think outside the box (and super healthy!) by adding things like dried kale to make green popcorn. This healthy Christmas treat provides a nice dose of fiber, antioxidants, and protein. Spray lightly with butter-flavored cooking spray and sprinkle with salt to taste. Toss in 1 cup of shelled pistachios and 1 cup of dried cranberries (or craisins). This kid-friendly snack couldn’t be easier. And it’s a much healthier version than traditional sugar-filled candy canes! Slice 1 medium-sized banana and 3 fresh strawberries into rounds. On a plate, line up the fruit into the shape of a candy cane — alternating between bananas and strawberries. Use the tapered ends of the banana or the strawberry as the ends of the candy cane. If you want the fruit slices to stick together for more than a couple of minutes, use a smear of honey, peanut butter, or sweetened cream cheese to “glue” them together. This is a holly jolly version of the traditional veggie tray. Choose a large round plate or platter and place a small bowl in the center of it. Arrange broccoli florets around the bowl to cover the plate. 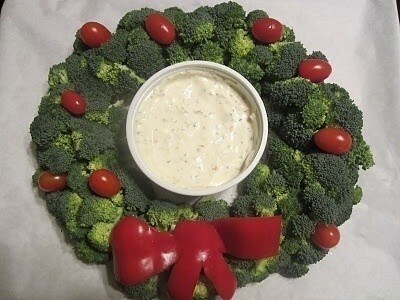 Scatter a few grape tomatoes or cherry tomatoes on top of the broccoli and fill the bowl with ranch dip. Garnish the bottom of the “wreath” with a bow made from cherry tomatoes and red pepper strips. This festive party tray is perfect for both adult and kid gatherings. The only 2 ingredients — cheese and grapes — pair perfectly with wine at a cocktail party and they’re appealing as finger foods for kids. If you have a Christmas tree shaped tray, use that. Otherwise, a plain rectangular platter will work fine. You’ll need both green grapes and red grapes and 2 or 3 varieties of cheese — cut into cubes. Begin with a layer of cheese to form the bottom row of your Christmas tree. A white cheese, if you are using one, looks best. Create a row of cheese cubes that extends most of the width of the tray and is about an inch-and-a-half in height. Follow by adding a row of grapes above the cheese, centered, but somewhat shorter than the first row. Repeat with alternating cheese and grapes — making each subsequent row shorter than the one before it. When you reach the top, you will have a nice tree shape. For added elegance, tuck some herb sprigs between the rows to look like greenery. These antipasto kabobs pack a punch of Italian flavor in festive Christmas colors. You will need wooden skewers, sliced salami, tortellini (use spinach tortellini if you want to add more Christmas color), whole green olives, mozzarella balls or cubes, and balsamic vinaigrette. Place the cooked tortellini in a bowl or a large freezer bag. Pour the salad dressing over the top and marinade in the refrigerator for a few hours, then drain the pasta. Fold salami slices in halves or fourths (depending on their size) and thread one onto a wooden skewer. Add an olive, followed by the mozzarella. Repeat layers until you have filled the entire length of the skewer. For a vegetarian option, use red cherry peppers instead of salami. 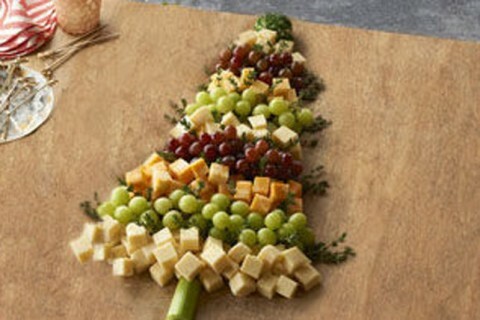 Other antipasto choices could include provolone cheese instead of mozzarella and green pepperoncini instead of olives. 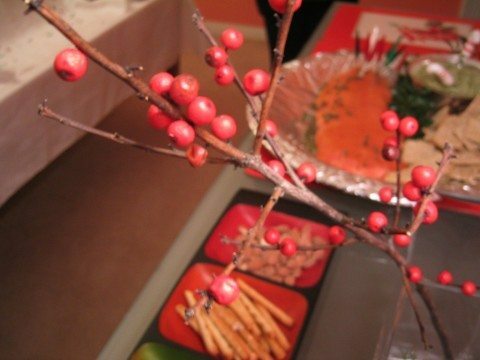 This is an easy snack that will add some Christmas color to your party table. Spread a generous amount of chive and onion flavored cream cheese onto large, round crackers. Dice baby carrots, green bell peppers, red bell peppers, and yellow bell peppers into small pieces. Chop a few small stalks of celery into 1/2-inch pieces. Using the carrots and pepper pieces, decorate the cracker “ornaments” with stripes, dots, and other fun designs. Be sure to lightly press the colorful pieces into the cream cheese so they’ll stay in place — especially if you’ll be transporting these. Finally, add one piece of celery firmly into the cream cheese at the “top” of each ornament. Spiced nuts are a delicious and healthy alternative to the candied or glazed nuts that often grace the Christmas table. They are full of healthy fats and protein and are low in carbs. 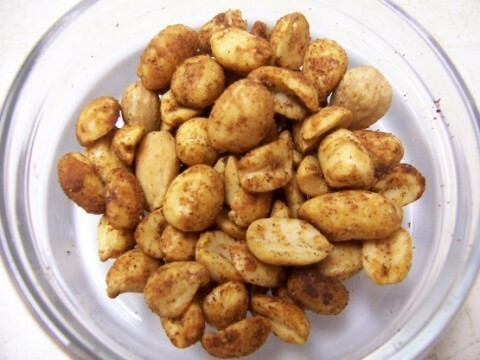 Mix 2 cups nuts of your choice with 1 tablespoon melted butter, 1 tablespoon lime juice, 1 teaspoon chili powder, 1 teaspoon salt, and the zest of half a lime. Spread the nuts out onto a baking sheet and bake at 350 degrees for 15-20 minutes or until browned. Enjoy the warm flavors of chili and lime on a cold winter day! These little veggie cups are a great alternative to the traditional veggie tray. Of all the recipes on this list of healthy Christmas treats, this one is the absolute easiest to prepare! Add 1 or 2 tablespoons of ranch dressing to the bottom of a 5-ounce clear plastic cup. Fill the rest of the cup with about long & thin sliced vegetables like red pepper strips, green pepper strips, carrot sticks, celery sticks, . Make one cup for each person. Arrange all of the cups on a cutting board covered in Christmas wrapping paper. Christmas is, without a doubt, a time to indulge. You don’t have to deprive yourself of all your favorite goodies. By swapping out just a few for the healthy treats on this list, you’ll enjoy a healthier holiday season with fewer pounds to lose in the new year.